For many Americans, Labor Day weekend marks the end of summer vacation and the last opportunity for a family getaway before school starts. If you're visiting the St. Louis area this Labor Day, there are plenty of festivals and events to celebrate the end of summer. In 2018, Labor Day weekend starts on Friday, August 31 and lasts through the holiday on Monday, September 3. From the Midwest Wingfest to the last chance to go swimming at public pools before they close for the fall and winter, you and your family have many options to choose from when it comes to spending the Labor Day weekend in Missouri. If you plan to stay a little longer, the weekend holiday also kicks off the September and fall events calendars in St. Louis, meaning you'll have plenty of chances to celebrate even if you miss the Labor Day festivities. If you like chicken wings, St. Louis is home to its own variety of this favorite bar snack on display at the Midwest Wingfest from Friday through Saturday in 2018. There will be dozens of gourmet and hot wings varieties to sample, plus a wing eating contest, 5K run, and car cruise. Midwest Wingfest will be held in the parking lot of St. Clair Square Mall in Fairview Heights. For those who love food, especially homemade pastries, the Greek Festival in the Central West End is a must on Labor Day weekend. This annual event attracts thousands of visitors who enjoy music, dancing and some of the best Greek food you'll find anywhere. The event kicks off Friday night with a special celebration in the beer garden, then continues through Labor Day. The festival takes place at the St. Nicholas Orthodox Church, which is located at Kingshighway and Forest Park Parkway in St. Louis. Labor Day weekend means the last days of extended hours at the St. Louis Zoo in Forest Park. The Zoo will be open until 7 p.m., Friday through Monday for Summer Zoo Weekends. Friday's events include the final Jungle Boogie concert of the season featuring the LustreLights. On Saturday and Sunday, visitors can watch animal enrichment and training at 5 p.m. The Great Godfrey Maze opens each year on Labor Day weekend in Glazebrook Park in Godfrey, Illinois and will remain open through October 28 in 2018. The seven-acre maze is a tradition in the Metro East and makes for a great day of fun for families, and in addition to the maze, there are also hay rides, a cow train, corn slides and other activities for the kids. On Labor Day weekend, you can also enter the maze after dark, but you'll have to bring or purchase a flashlight for admittance. 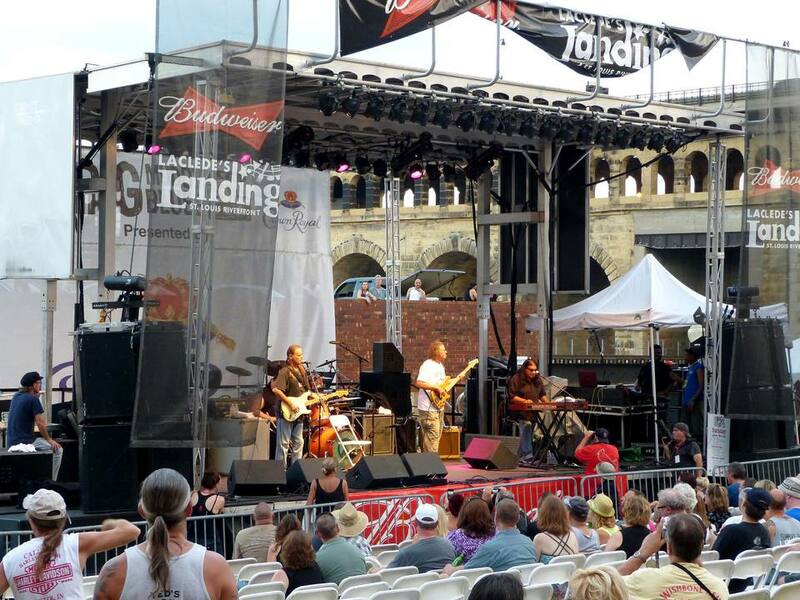 From Friday through Sunday on Labor Day weekend in 2018, music will be the big draw on Laclede's Landing at the Big Muddy Blues Festival. This outdoor music festival features more than 50 local and nationally known artists that will perform on different stages set up throughout the Landing. Restaurants on the Landing will also be serving up food and drinks during the festival for whenever you need a break or a bite to eat. Take in four days of bicycle racing in four different St. Louis neighborhoods at the Gateway Cup Bicycle Race over Labor Day Weekend in 2018. Pro-am cyclists compete for cash and prizes during the annual Gateway Cup in Lafayette Square, St. Louis Hills, Benton Park, and The Hill. There are also recreational and children's rides for amateur cyclists of all abilities. You can kick off Friday and Saturday of Labor Day weekend in St. Louis by heading out to nearby Hermann and Missouri's wine country for the annual Harvest Fest at ​Stone Hill Winery. The celebration includes pumpkin painting, grape stomping, and free live music from 1 to 5 p.m on Saturday. Eckert's is celebrating Applefest over Labor Day weekend at its Belleville farm, starting off with the last free summer concert on Friday afternoon. The festival itself then runs Saturday through Monday from 10 a.m. to 5 p.m. daily. There are all kinds of apple treats for sale as well as pick-your-own apples, and the celebration also includes wagon rides, live entertainment, and plenty of children's activities for kids of all ages. If you're looking for an activity that's both fun and educational, you can take a river cruise on the Mississippi River this Labor Day weekend. A guide will take you on a one-hour tour on the 49-passenger River Rambler, sharing information about the history of the river and its important geological features. The tour boat has an enclosed first level with air conditioning and an open top level. It sets sail from Grafton Harbor north of St. Louis. St. Louis might not be the first place you think of when it comes to celebrating Japanese culture, but each Labor Day weekend, the Missouri Botanical Garden hosts one of the largest and oldest Japanese Festivals in North America. The event features traditional music, dancing, and storytelling in the Garden's authentic Japanese strolling gardens. Visitors can learn about the art of Origami or attend a traditional tea ceremony. Another highlight of the three-day event is the chance to see a real sumo wrestling demonstration. Enjoy an evening of jazz at a free outdoor concert along the banks of the Missouri River in Frontier Park. The St. Charles Jazz Band will perform at the park's Jaycee Pavilion. Everyone is invited to bring a lawn chair or blanket and relax under the stars for this free event in St. Charles. Thousands of local union members will march through Downtown St. Louis for the annual Labor Day Parade on the Saturday of Labor Day weekend in 2018. The parade begins at 9 a.m., at 13th and Olive, then makes its way down Tucker Street, past St. Louis City Hall and west on Market Street to 15th Street. Many Metro East union members and their families will celebrate Labor Day at the annual parade and picnic in Belleville. The parade begins at 10 a.m., along First Street in downtown Belleville. After the parade, there is a picnic in Hough Park beginning at 11:30 a.m.
Labor Day weekend is your final chance this year to take in the sun and fun at Raging Rivers, Splash City, Hurricane Harbor, and other local water parks. Labor Day is also the last day of the season for many smaller community and neighborhood pools.